EZ/6 Collapsible - BEST SELLER! 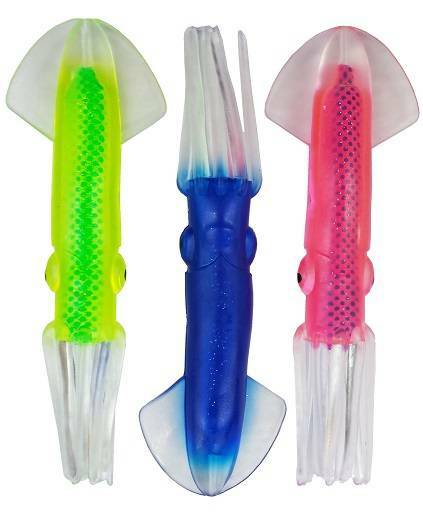 9" Rubber Squids in the 3 most popular colors. They are light enough to rig on any Dredge or Splash/Bar or Spreader/Bar and just heavy enough to keep them running great. Rigged on one of our EZ/2 Collapsible Teasers they can't be beat. If you aren't on our email list, you're missing out! Stay current on all of the latest here at Tournament Cable. New products, discounts, sales, special announcements, and more! AT TOURNAMENT CABLE INC. WE COMBINE EXPERIENCE, INNOVATION, AND TECHNOLOGY TO PRODUCE THE ULTIMATE GLOBAL SPORT-FISHING TACKLE. © 1997-2018 TOURNAMENT CABLE INC.